Optimised Logistics to Minimize Costs! The Vegetal i.D. Logistics service carries out several dozen trips per week in France and abroad, for projects ranging from 30 to 10 000 sq m. Each project has its own specific specificity. Depending on requirements, we group together materials for the same project for efficiency and can use refrigerated trucks, cranes, pick-ups or silos. 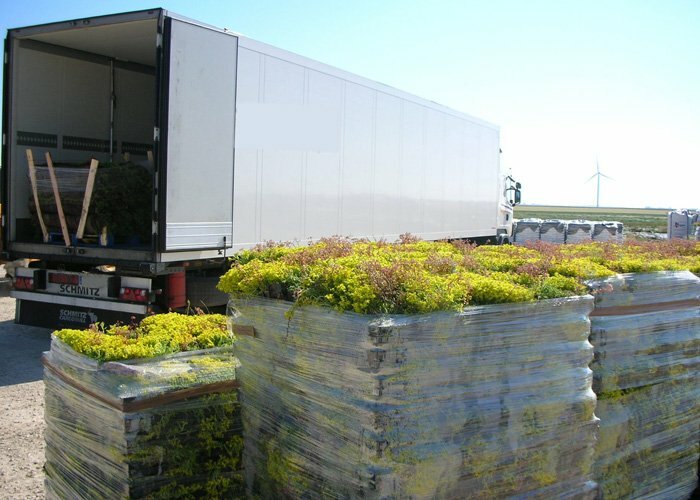 At Vegetal i.D., we recognize that time costs money, this is why our product is optimized not only to minimize direct shipping costs, but also to deliver healthy vegetated green roof products to the project site on-time. The pack sizes of plants and other components of the vegetating system are adapted to suit the size of the project: loose, big bags or silo truckloads are possible.